Check out our ESL lesson plans and resources if you're an ESL or EFL teacher looking for quick ideas or activities. Much of EnglishHints.com is written for Intermediate to Advanced ESL students studying independently. Many of those pages have ideas teachers could use too. Practice pages often have associated pdfs-- accessible through Free Printable Worksheets and other pages. 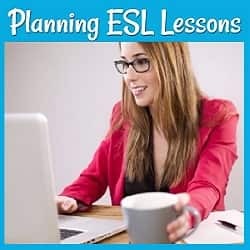 Friends teaching ESL, often in countries with limited school resources, have asked me for hints and ESL lesson plans, so I added this section for ESL teachers. 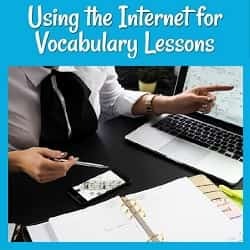 It includes planning basics, favorite classroom activities and lessons, and recommendations for books and sites I’ve found most helpful in fifteen years of ESL teaching and web-surfing. Go directly to the free lesson plans. 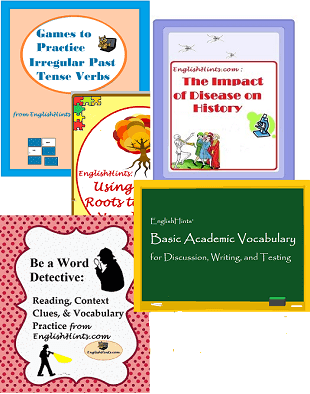 In other sections of www.EnglishHints.com you can find help with vocabulary, idioms, and grammar, readings and ideas for teaching reading, practice exercises, and games. The ESL Games section has several pages with ideas for classroom games, and a page specifically for teachers: Printable ESL Classroom Games, both free and in inexpensive packets. ESL Worksheets are also designed specifically for classroom use, from upper elementary to adult, for classrooms in English--speaking countries or EFL classes. Many are free, but there are also some inexpensive packets including (besides worksheets) lesson plans or suggestions, explanations and examples, reading material or links to reading or listening activities, and games. Most are organized around a specific topic (to allow repeated exposure to the main ideas and vocabulary). I have made them as clear and engaging as I could, as well as easy to implement in a classroom. The links that follow are specifically for group work: classroom lesson plans and activities for ESL students of various levels. You are welcome to reproduce any of these activities or lesson plans for individual or classroom use, but they are copyrighted and may not be sold or used on another website. Success in teaching begins with planning. Your school may provide you with a curriculum. If not, find out your students' needs and priorities, and consider the best ways to build on what they already know and help them reach their next goals. (With beginning students you can use the students’ native language or a checklist of pictures of different possible language uses with English captions.) Knowing that the class will focus on (or at least consider) their needs and desires can be a great student motivator. Once you have a basic idea of what topics to teach and when, you need to make or find lesson plans to teach them. See Planning ESL lessons and Using the Internet for Vocabulary Lessons for some pointers on making your own. Good lessons use a variety of learning styles and provide lots of practice activities. You might start by checking out some adaptable ESL activity ideas and some ESL conversation starters. You can also download lessons from many sites on the Internet (see ESL Teaching Resources) but will need to adapt any lesson to meet your students' specific needs and interests. If you are planning a reading lesson, see Reading Comprehension Strategies for pre-reading preparation and post-reading comprehension checks. For ideas for helping students learn specific reading skills like skimming, decoding, using context clues, and making inferences, see Improve Reading Skills. The lesson plans for ESL students below demonstrate some of the skills needed to plan a good lesson. Lesson Plan on Clothing Vocabulary and Shopping: Teams design clothing stores, then “shop” at each others’ stores. This was a favorite lesson in my adult classes year after year. Lesson Plan Introducing the Present Continuous Tense, with lots of acting out and miming, discussing pictures, reading, and writing. An A2 level Listening lesson plan with comprehension questions using a few TED talks on hope. A related listening lesson (or partial lesson) on a TED talk on the Dangers of a Single Story. Reading Comprehension Lesson Plans offers several pdf packets for 1-2 days to 2 weeks' worth of lessons on disease in world history, available from $1.00- 4.25. They include readings, worksheets as well as comprehension questions for class discussion, a web quest, video links, and other activities. Be sure to modify these (or any) lesson plans to meet the particular needs of your class, considering what you know about your own students’ culture, learning styles and levels, prior knowledge, and interests, as well as time and material constraints. I don’t think I ever taught the same lesson twice without fairly significant modifications. Still, a plan that has proved successful in the past is a great starting point. I originally planned to include the lesson plans for many of my favorite lessons. However, time constraints (and the great materials now freely available on the internet) have greatly reduced the number of lessons I have put up. Instead, I’d like to point you to the single most helpful resource for adult ESL lesson plans that I have used-- and it’s free! Another teacher shared it with me, and for years I didn’t know that it was available online... So instead of trying to write up my variations, I want to recommend these lessons that my students and I have found especially helpful. The L.A. Unified’s Tools for ESL Lesson Planning (a 176-page pdf-- allow a little while to load) has great explanations of the most useful ESL techniques AND 35 (2 1/2 hour) sample adult ESL lesson plans. (There’s one plan each for 5 different levels in 7 competency areas: personal information/interaction, consumer education, community, health and safety, occupational knowledge, civics, and learning skills.) They provide clear plans and two reproducible hand-outs for each lesson. These lessons are designed for adults living in the U.S., but most would be adaptable to other English-speaking countries and quite a few to EFL classes or younger students as well. I have tried (and/or combined/modified) more than half of them and highly recommend them. If you have a much shorter class time, they can be cut-- or divided into 2 lessons. “Fill out a medical (history) form.” Since this lesson is reviewing the present perfect tense, another good warm-up is a “Find someone who has _____ (had a particular disease, broken a bone, had a vaccination-- if not universal in your country, etc.) If you are making it into two lessons, this might be first-- required before a doctor visit-- and role play interviews with ‘the doctor’ might follow. I’d recommend printing the sections of the pdf that you intend to use so it’s easily available when you want to refer to a particular lesson or print its hand-outs. Where to go next? Check out ESL Worksheets for free and inexpensive exercises and games (some with suggested lessons and integrated reading and writing as well) for teaching and practicing vocabulary, roots and affixes, irregular verbs, and other grammar points. ESL Worksheets and Lesson Packets describes the various worksheets and lesson plan packets available on EnglishHints. Several are free, and the others are inexpensive-- and value-packed. Help your students learn vocabulary in context using sites with reading or listening content & tools to check levels. Prepare for a great year & engaging lessons even without a textbook. Games are so useful in ESL classes! 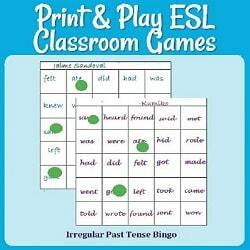 Get free printable puzzles, vocabulary matching games, and inexpensive packets of games to practice irregular verbs.